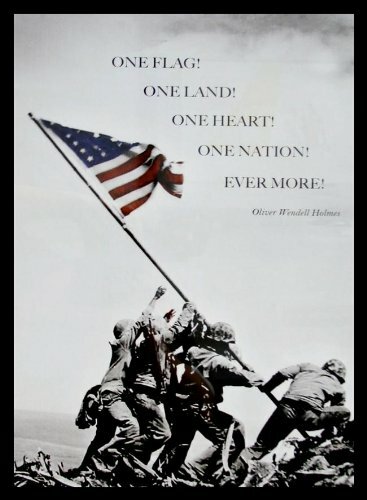 ...D-Day...also known as Operation Overlord, the decisive start of the liberation of German held Europe during World War II via the beaches of Normandy, France. 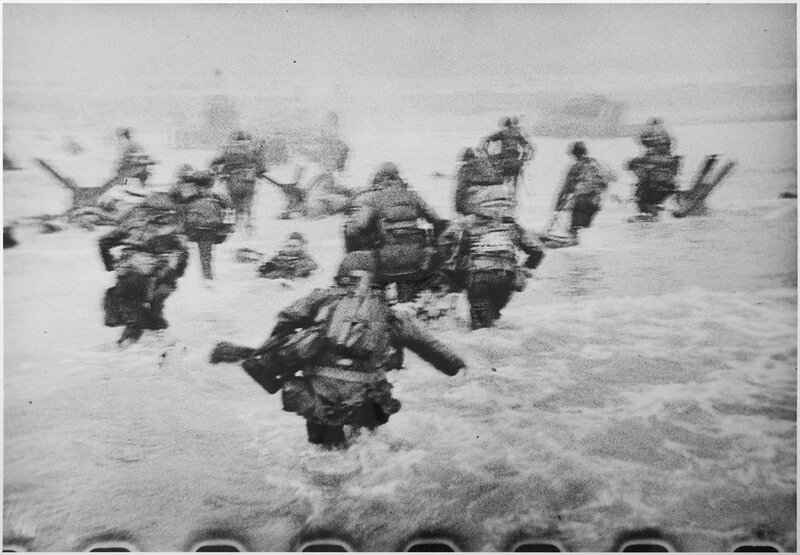 There were five targeted beaches for landing points that morning: Utah, Omaha, Gold, Juno and Sword. None of them were easy of course...enemy forces were poised to kill the liberators from superior vantage points as the vulnerable soldiers disembarked their landing boats. But Omaha beach was the meat grinder. Overall kill rate at Omaha was 8% of all landing forces...that's 2,811 men killed out of a little more than 34,000. But those are summary numbers taken days after the victory had been won. 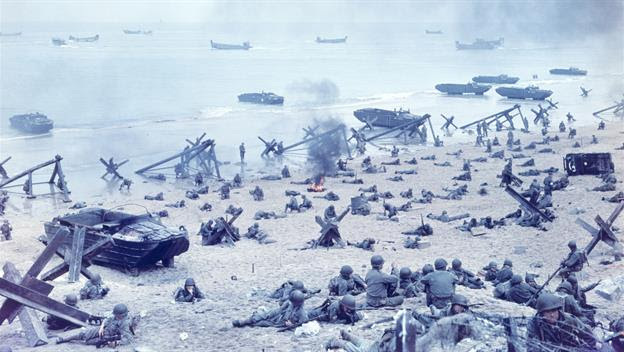 What was the kill rate on Omaha when the first companies - Able, Baker, Charlie - made the initial attempt to storm the beach at 6:30 in the morning? ...that is still in 8 feet of seawater and 20 yards from shore. You obediently race off the relative safety of the landing craft and into the frigid waters where you discover with a shock you can't touch bottom. Panicked, you realize you're in over your head and rapidly sinking to the ocean's floor. If you're quick witted enough you struggle to shed your 50 pound pack of gear that's supposed to help you survive this mission and bob to the surface to catch a gulp of life giving air. As you do the water is strafed by machine gun fire from the bluffs high above you, and instead of catching your breath you take a bullet in the throat. It took less than 30 seconds for you to die and you didn't even reach the beach. I'm sorry, but it's not possible for most of us, sitting in the comfort of our homes, leading our sedentary lives of peace and safety, to grasp the terror of that morning on Omaha Beach in Normandy, France. That any of that first wave of the liberation force was able to traverse the deadly stretch of sand from the shoreline to the bluffs is - well, depending on your spiritual view of the universe, either a miracle or some unexplainable quirk of fate. But in spite of the overwhelming odds against them and the mounting evidence of tragic failure all around them, those soldiers kept coming, kept disembarking, kept dying there in the blood red surf with only 1 out of 10 being able to inch their way to safety. It staggers the imagination to try and conceive of the deadly reality of that morning, but they experienced it. In spite of the impossible odds against them, they established a beach head and the objective that was supposed to be achieved that morning was finally realized over the course of several days. Those men deserve our undying thanks, respect and reverence. So on this early summer day, 74 years removed from the unspeakable horror of that awful time of unmatched bravery and ultimate sacrifice, take a moment to give thanks to God in heaven for heroes such as them. We - and much of the world - are free because of what they did on that terrible, glorious day.